Want to level up in 2019 well entrepreneur, branding guru, and inspirational speaker, Morgan Owens is here to help. 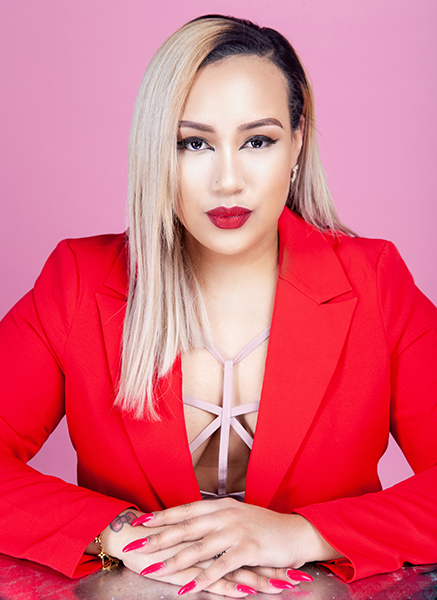 Owens is not only dedicated to educating millennial women but she is also passionate about helping them “Find Their Sparkle.” Find out just what we mean by reading along as the boss lady talks about her book and offers her best advice. I have worked in Marketing/Communications, Branding, and Diversity & Inclusion in the collegiate/corporate world for almost a decade. I worked my way from an assistant to a coordinator, to a digital editor, to a consultant by the time I was twenty-nine. I have helped build and grow billion-dollar corporations’ social media platforms and marketing campaigns, as well as win the national awards for work in Diversity and Inclusion. I founded Curvy Cardio almost five years ago, the purpose of Curvy Cardio is to help women embrace their curves (no matter what size) and love their bodies free of body shaming. Curvy Cardio offers classes, offers online-based challenges and partners with schools teaching young girls the importance of having a healthy self-esteem and body image. In 2016, the Morgan A. Owens brand was established as a voice for women who had a desire to become more marketable in their corporate careers as well as entrepreneurial endeavors. With the mission that women can be “powerful and pretty,” Morgan introduced a plethora of chic and trendy events that embodied this concept. These workshops serve predominately minority women with a mission to climb the corporate ladder as efficiently as their counterparts, gain corporate appeal in their own business, start their own business, or a mission to increase their bottom line while embracing their feminine and authentic selves. Why are you so passionate about teaching millennial women to be success? I believe I am so passionate about teaching millennial women to be successful because simply, they can be. Often, we are our own worst enemy, second guessing, self-doubt and self-sabotage can get in the way of our success. We can try to blame others for our failures but sometimes we need to take a good look in the mirror and realize it may be ourselves. I strive to be that person to help women break down those barriers of self-doubt and realize with hard work, a plan and purpose anything is possible. How are you able to teach people to “Find Their Sparkle” in a world full of clutter? I am able to teach people to “Find Their Sparkle” in a world full of clutter by sharing my story and encouraging those to find self-love. I am a firm believer that you can do anything if you truly love yourself. The no’s, closed doors and clutter will not matter and be a motivator rather than a deterrent. What advice would you have for one that may want to leave the corporate world to become an entrepreneur? My advice would be to make a plan and be disciplined about it. When I decided I wanted to become a full-time entrepreneur I not only had to change my mindset but my lifestyle. I loved going out to happy hours, going out with friends, spend money (more than I should) but I knew all that would have to change in order to really do what I wanted to do. I stopped going out, instead, I spent Friday and Saturday nights at home working on my business. I lost friends because of it, so you have to also prepare your mind that not everyone is ready to see your grow because often they aren’t ready to grow. Also, you have to be honest with yourself. There have been many successful entrepreneurs who still hold down their 9-5’s. Don’t let social media full you, full time entrepreneurship is hard – really hard. At times it can be isolating, and you’ll feel alone. It is not meant for everybody and that is okay. You have to figure out what works for you and what doesn’t. What does 2019 have in store for Morgan Owens? I am so ready for 2019, honey! I’ve been saying 2019 is my “blooming season.” I have spent the past five years planting, sacrificing and doing the work to be successful. My plan is to travel to cities I have not been in to helping other women find their sparkle, launch another book geared towards how to bloom your business/brand, my 2nd Professional Pretty Conference (personal, professional and business development) in May in which I hope to double the number of attendees, helping more young girls boost their self-esteem and confidence and wherever God leads me I am open and receptive to it. Click here to visit Morgan Owens’ official website today!